Promotion Offers: FREE SOPHIE ALLPORT BAG! 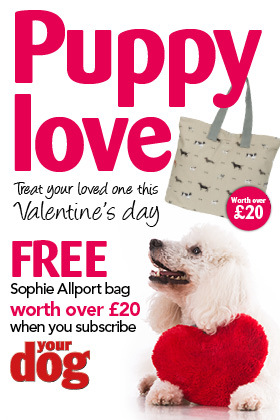 Share the love this Valentine’s Day with not only a gift subscription to Your Dog Magazine, but also a FREE Sophie Allport Bag worth over £20. Now, that’s what we call a real treat for your sweet this Valentine’s Day! Half yearly Direct Debit of £19.99 with free Sophie Allport bag worth over £20. FREE Sophie Allport Woof Everyday bag worth over £20! : This wonderful lightweight bag is comfortable slung over your shoulder for carrying just about anything! It's a stylish and practical bag and would make a great gift for any dog lover.